It is good to hear some lesser-known organ transcriptions of Elgar’s music. Volume 1 (MDG 316 1836-2) of this ‘Festival’ presented Nimrod from the Enigma Variations as well has the superb Organ Sonata No. 1, op.28. The present CD opens with the Imperial March which was written in 1897 to commemorate the sixtieth anniversary of Queen Victoria’s accession. It has never quite caught on at least not the way that the P&C marches have caught on, however this is a work ideally suited to the organ. The ‘big’ tune is calculated to raise the hairs on the back of your neck. It was arranged for organ in the same year by George Clement Martin who was at that time organist of St Paul’s Cathedral. The two pieces of salon music, ‘Chanson de Matin’ and ‘Chanson de Nuit’ have been ‘dished up’ in many versions by the composer and others. ‘Charming’, ‘nostalgic’ and ‘well-constructed’ are suitable adjectives for these pieces. They work well on the organ. Little need be said about the CD’s concluding work, which is one of Elgar’s most popular works. Pomp and Circumstance March No.1 in D major was composed in 1901 and arranged the following year by organist and composer Edwin Henry Lemare. It makes a fine and rumbustious conclusion to this exciting exploration of English music. The first piece of music by Alfred Hollins that I ever heard was the present Song of Sunshine; it has remained a favourite ever since. In spite of being ‘light-hearted,’ this is a well-crafted little piece that nods towards the cinema organ rather than the cathedral. It is beautifully played here. The Chorale with Variations in E flat major by Henry Thomas Smart is an interesting piece of Victorian organ music that defies the old idea that music from this period is all ‘grind and scrape’. Smart displays considerable skill and invention in the working out of his variations and presents music that holds the attention and moves the listener. It is a good balance between head and heart. Hubert Parry’s Fantasia and Fugue in G, op.188 is an impressive work by any standards. Originally composed in 1877 the ‘fantasia’ section was rewritten five years later. Finally, in 1912 he provided a new fugue. The work reflects a number of musical exemplars including Bach, Brahms and Reger. The opening fantasia has an improvisatory character with a splendid climax. The fugue is beautifully contrived with the running semiquavers giving movement whilst the last pages refer back to the fantasia. Gwilym Beechey has describes this work as one of the ‘finest pieces of English organ music of the 20th century’. The Fantasia and Fugue in G was dedicated to Sir Walter Parratt. The work, which is technically difficult, is given a great performance here. The Larghetto in F sharp minor is the second of ‘Three Pieces for chamber organ’ written by Samuel Sebastian Wesley for the ‘house organ’ of Lady Acland of Killerton (near Exeter, Devon). It is a introverted little piece based on variation that is sometimes quite nocturnal in mood. John Ireland is not normally associated with organ music, yet he was an organist for much of his life and composed a small number of pieces, largely between 1902 and 1922 during his time at St Luke’s Church, Chelsea. The present Capriccio is a miniature masterpiece. A lively little piece that is ‘light’ and ‘whimsical’ in character with a huge variety of registration. This is one of my favourite pieces of English organ music: it deserves to be better known. Frank Bridge’s Adagio in E major is a beautiful piece: it is probably the composer’s best-known organ work. Opening fugally, the music slowly builds up to a considerable climax. The music dies down to a whisper with a reminiscence of the main theme. This is deeply-felt heart-breaking music that exudes the mood of a passing Edwardian ‘summer’. It was composed in 1905. There are two sets of Psalm Tune Preludes by Herbert Howells: the first was composed during 1915-16 and the second just before the outbreak of the Second-World War. The third Prelude of the second set was dedicated to Percy C. Hull who was then organist at Hereford Cathedral. It is a big, powerful piece full of energy and dynamic rhythm. The Prelude takes takes its mood from the words of Psalm 33, verse 3 ‘Sing unto him a new song: play skilfully with a loud noise’. Certainly this work achieves that aim. Minor drop-offs in the liner-notes and listings include a reference to Sir Alfred Brewer, better known as Herbert and that Edward Elgar was born in 1857 not 1844, and died in 1934 not 1925. These apart, the text written by van Oosten is extremely helpful. Short biographies of the composers complement succinct programme notes for each work. There is the all-essential specification of the organ as well as a short history. Combine the fantastic sound of the excellent ‘Father’ Willis organ installed in 1876-7 and the performance skills of Ben van Oosten and you have a definite winner. Add to that a wisely chosen repertoire of English organ music and this becomes a must-buy CD. 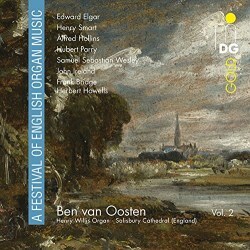 I tend to think of van Oosten in terms of his cycles of organ music by Saint-Saëns, Vierne, Widor, Dupré and Guilmant, so to have a CD that includes a wide exploration of English music is of considerable interest. There is no doubt that he has excelled himself with this present recording.